Sculpt360 is so excited to feature South Jersey based Gabrielle Terzano of Live Laugh Yum with her first post for our blog. At Sculpt we want to bring you some variety to our posts starting with Gabby’s first recipe plus the benefits of each ingredient for us. Make sure to check out her blog Live, Laugh, Yum! for more amazing recipes. 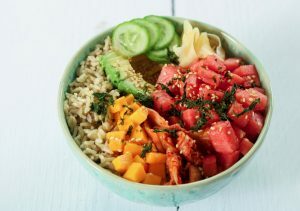 Nourish yourself with a delicious and refreshing watermelon poke bowl! This dish is a perfect summer dish that is perfect for refueling your body after a workout. 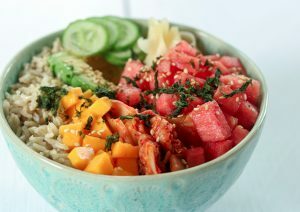 Watermelon and mango with kimchi and pickled ginger is the perfect sweet, savory and spicy combination. Add some brown basmati rice and avocado for the tastiest balanced meal… and it’s easy!! Watermelon: Watermelons are about 92% water, which means they’re super good for hydration. It is filled with vitamins A, B6 and C. it’s also loaded with antioxidants and amino acids. Mango: Mangos are high in antioxidants, fiber and vitamins C, A, B6 and E. They can also help lower blood sugar levels and can boost brain health! Kimchi: Kimchi is actually fermented cabbage and is great for gut health as a probiotic. It is high in vitamins A, C, B and minerals like calcium and iron. Brown Basmati Rice: Being less processed than white rice, brown basmati rice contains more fiber and is a healthy source of whole grains. Complex carbohydrates are important for brain and body function! Ginger: Ginger has anti-inflammatory properties, can treat nausea, and boosts immune system. 1. Cook your rice according to package instructions. 2. Mix all dressing ingredients in a small bowl. 3. Combine all ingredients except dressing in a bowl. 4. Drizzle dressing over everything, add sesame seeds and toasted seaweed and enjoy!